We are grateful that Illinois State Senator Sue Rezin and Representative Frank Mautino have both written letters to the ICC opposing RICL. As we educate more of our representatives across the state that this project undermines renewable energy and permanent jobs in our own state, we expect the stack of letters to grow. Senator Rezin's second letter to the ICC also asks for a "Notice of Inquiry." This is a measure that can protect Illinois ratepayers, taxpayers, and landowners from very expensive and long-term mistakes. Click here to see Senator Rezin's letter to the ICC dated March 21, 2013. Thank you, Senator Rezin! Bureau, LaSalle and Rock Island County boards have yet to sign off on RICL's extremely one-sided and unfair "agreement." We deeply appreciate the county board member efforts to dig past the kool-aid sales pitch and not buy into the verbal "promises." Rumor has it that county representatives are being asked to meet INDIVIDUALLY, and NOT in a public meeting or setting. The individual board members are being told that they better take the agreement now, because they won't get anything later. If "Clean" Line is such a "great" company, why the rush and high pressure to sign the "agreement" ?? Please contact your county representatives and send your concern about such "private" meetings. Before ANY agreements with any private company are signed, the landowners whose land would be permantly damaged, degraded, and devalued deserve to be NOTIFIED and have a public hearing where they can ask informed, educated questions of the company in a legally binding forum. Also express your support of their efforts to not give in to pressure to accept an unfair agreement that is NOT in the best interest of any county resident or landowner. Counties that have already signed the "agreement" which RICL uses a proof of "support" at the Illinois Commerce Commission. Contact your board and ask for full disclosure of the "private" meetings that were held with representatives from RICL. When was there a public hearing before signing the agreement? What independent research did they do into the company before signing? What verbal or personal promises were made that are not in writing? Grundy: Has NOT signed off on the 100% tax abatement for the convertor stations as requested by RICL. To their credit, Grundy County was led to believe that the route was along a railroad easement. ALERT LaSalle and Bureau County Boards and ALL Road Commissioners Don't let the huge WRONGS that happened in Henry, Grundy, Whiteside, and Rock Island counties happen on YOUR watch. The Rock Island County fiasco: In April, the RI County board voted to table the proposed "agreement" with RICL until or if they got public utility status (at least 2014, if ever). IN MAY!!! the board untabled the agreement AND passed it in one meeting. Landowners found out too late to speak!!! They were in the fields planting- thinking this was tabled- but in the meantime, between one board meeting and the next, "Clean" Line was at work behind the scenes with board members and labor unions who shoved it through the next month..... And RICL claims to be "transparent" and working with farmers. Bull. Many reports are coming in on individual board members and road commissioners being asked to meet individually with "Clean" Line reps. LaSalle County voted UNANIMOUSLY to table the "agreement" months ago citing what a poor, one-sided, and full of loopholes document it was. Now is it making sense why RICL would hire an ex-county board member in a county that has been clearly opposed to the project? It is WRONG that counties can make an agreement with a PRIVATE company that causes irrevocable damage to PRIVATE property for PRIVATE gain without notifying the landowners affected. How can this be? At the VERY LEAST, landowners NEED TO BE NOTIFIED and there needs to be a PUBLIC HEARING where the landowners and the public can ask the tough questions (that nobody else bothers to consider) in a LEGALLY binding forum. A private company from Texas, with a couple of billionaire investors, working behind the scenes to take private land for private gain BEHIND THE BACKS of those being detrimentally affected is wrong. Just plain W.R.O.N.G. This is a HUGE violation of property rights. Contact your LaSalle and Bureau county board members and let them know you support their continued opposition of RICL. Just to be clear, and regardless of what RICL reps try to claim, RICL uses these county agreements as "endorsements" at the Illinois Commerce Commission and in their kool-aid sales pitches. "Clean" Line reps tell our Illinois boards that 'out of the goodness of their hearts' that they're 'agreement' is based on Iowa counties receiving $7,000 a mile for transmission lines. First, these high-voltage transmission lines are MANY times bigger than anything this $7K a mile is based on and probably outdated land values. Second, "Clean" Line's 'agreement' with Illinois counties ends in 20 years and does not appreciate. What "Clean" Line reps have failed to mention is that in Iowa, it's called a Replacement Tax and does not end. In other words, it acknowledges that transmission lines cause a devaluation of land which affects the tax base. This isn't a bonus tax, it makes up for losses to the counties.... in perpetuity. So any of our Illinois counties that have already signed this 'agreement' are losing out- big time. Several local representatives have signed generic letters which RICL is using at the ICC to show "support" for the project. Watch this page for names of representatives who need to be educated on the true costs of this project to Illinois consumers and taxpayers! See more information on what to do - writing letters to representatives! 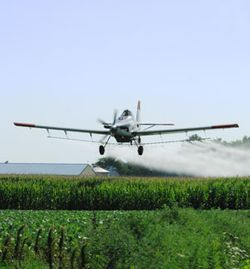 Crop dusting is a critical tool in raising crops. For the dangers of power lines to aviation, click here.